While pregnancy is generally a healthy state of being, there are some pregnancy related problems you should be aware of. During pregnancy, your baby usually thrives and you do too as you count down the months until you greet your newborn. Although minor problems are common, the major ones are rare and can generally be handled well in our modern hospitals. Can Previous Chlamydia Cause Problems with Pregnancy? Severe anemia may increase the risk of premature birth, so it's important to discover if you have this condition. It is usually easily treated with diet changes or supplements, and symptoms generally improve within just a few weeks. During pregnancy, your body makes almost a third more blood, and this process (called hemodilution) requires good nutrition. Some women need extra iron during pregnancy, but many do not. Iron supplements should never be taken unless your midwife or doctor does a blood test to discover if you are actually deficient in iron. If she/he does advise you to take iron, you will find many types at the drugstore. Ferrous Sulfate is effective and the least expensive form but also is the one most likely to upset your stomach. You may need to try another form of iron or wait a few weeks until morning sickness passes. It's also a good idea to take vitamin C and B whenever you take iron supplements. A word of caution. Please be careful to keep iron supplements away from children. Even a few iron pills are enough to poison a young child. MayoClinic.com suggests that fatigue is one of the earliest signs of pregnancy. Most women experience fatigue during the first few months. There is no treatment more effective than taking the chance to lie down for an afternoon nap. If you can't sleep, at least lie down for a half an hour. Morning sickness makes you feel terrible, but it is usually temporary. The American Pregnancy Association says that it usually begins at about six weeks and stops at around 12. Watch what you eat and when you eat. Avoid greasy or spicy foods for a while. Try to keep your blood sugar stable by snacking on high protein foods or by eating several smaller meals through the day. Crackers and dry foods like toast may help, especially if you eat them the very first thing in the morning (yep, even before you get out of bed). Our grandmothers would advise us that ginger soothes the stomach and they would suggest candied ginger, tea, syrup, or ginger ale. 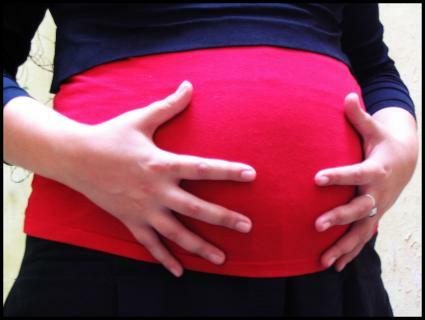 According to WebMD, nearly half of all expectant mothers report severe indigestion at sometime during their pregnancy. You may need to avoid spicy or greasy foods or drinking liquids with your meals. Many women are helped by chewing mints or drinking mint tea, or by using calcium supplements like Tums. Mild exercise or a short walk after meals will often settle the stomach. The best thing you can do is to improve your diet by adding more fiber. Eat extra servings of vegetables and fruit, and whole grain cereals like oatmeal or granola. Try eating dried fruits, especially prunes. Juices may help too, but be aware that fruit juices contain a lot more sugar than you may wish. If you are still eating white bread, changing to a whole grain variety is a tasty way to get fiber as well as essential vitamins. MayoClinic.com also suggests drinking more water and adding some physical activity to your daily routine to prevent and treat constipation. Do not use laxatives, enemas, or stool-softeners without consulting your care-provider! Sometimes these can cause labor to begin prematurely. Almost every woman can list backaches as a pregnancy related problem. According to BabyCenter.com, back pain occurs most likely resultant of hormonal changes. Walking and swimming are good prevention exercises to tone and strengthen the muscles. Some women find relief with special support garments which lift the abdomen. If you are having frequent backaches, take a look at your shoes. If the heels are too high they will distort your natural posture and can really be a pain in the back. Try soaking in a warm bath or curling up with a heating pad. Herbalists often advise that a massage with St John's Wort Oil is especially effective for relieving backache.